Fantasy Baseball season is back and the NL King is ready help your win your NL Only league again in 2012. Just to recap, I play in a super competitive keeper auction NL only league. Same guys every year, big money with a ton of strategy and preparation. I love to share my knowledge and The Fantasy Man gives me a place to do that here at Fantasy Baseball Express. I'm just a regular guy who love fantasy baseball so I'm back to provide my insight to NL Only leaguers for 2012. I hope you enjoy and I encourage any comments and feedback below. Good luck in 2012. This years off-season kickoff  article will be about asking key questions in the NL, so let's set up the scene. the substantial free agents will be signed as well as significant trading in MLB that will effect the National League. Support the cause! 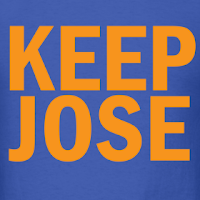 get the Keep Jose Reyes T-shirt here! - What went right for your fantasy team last year and what went wrong? If you finished in the money,  what worked? If you didn't finish in the money, why not? - What players emerged last year (i.e. Craig Kimbrel, Jesus Guzman) ? Who took a step backwards (Carlos Lee, Jason Bay)? Why did this happen to these players (team, ballpark, contract, age, etc)? - Astros AL Bound for 2013 what effect will that have in 2012 for NL leagues? - How do your keepers look heading into next season? What are the strengths and weaknesses of your keeper list and of your draft for 2012? How is the off-season trade market look? How do your keepers match up compared to the rest of your league? - The percentage categories are changing dramatically over the last 4 years, will that continue? - What will be the impact of this years free agent crop on the NL? - The New Marlins Stadium - how will it affect Marlins players for fantasy baseball? The Mets also moved in, who will that affect? - Matt Kemp's $160 million dollar contract - what will that mean for his stats in 2012? - What prospects / minor leaguers should we keep tabs on for 2012? Potential call up? These are some of the questions we will answer over the next 6 weeks before the position rankings articles. they are changing dramatically in the NL. Everyone have a great Thanksgiving day !!! !